Red must make it easier to hide the blood stains. Unless of course you're a Vulcan. 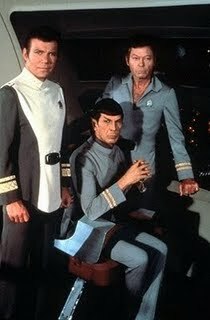 But Vulcans would never be dumb smart enough to put on a red shirt. Red shirts never make it back. How many letters to red shirts’ family members did Captain Kirk have to dictate? Sadly, and with a sigh. Anyway, we all know that if you’ve got a red shirt on, you’re not coming back. And now Matt Bailey has proved it statistically in his analysis of the Red Shirt Phenomenon. I need to get bombed and send these people some sketches from my bar napkin.